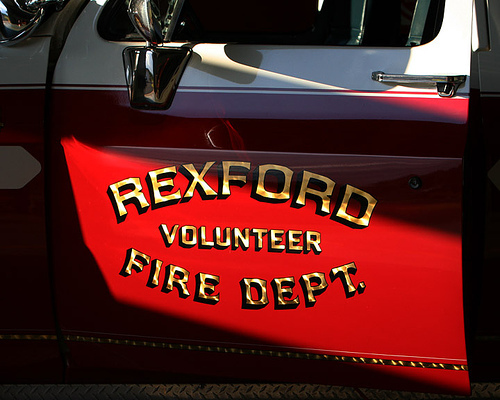 Soon after the burning of the cement shed in the spring of 1923, a meeting was held by several residents of Rexford for the purpose of determining what could be done to protect life and property from damaging fires. Those attending this meeting were Michael Travis, Joseph Mahar, Fred Bennett, William Drumm, John McLane, Jr., Edmund Hinchcliff and Homer Tracey. The meeting was held in Mr. Tracey’s combination ice cream parlor and confectionary store. The resulting conclusions of the meeting were; that if a small shed or shanty could be built, near the church, to house fire extinguishers and pails, the residents of the village would have a common place suitable for obtaining firefighting equipment. Further, the church bell would be used for a fire alarm. So many residents approved of this scheme, that it was suggested that a public meeting be held in the schoolhouse. The object for this meeting was to consider the forming of a fire department. The meeting at the schoolhouse was held about 2 weeks after the meeting in Mr. Tracey’s store. Reverend T.M. Bishop was elected as chairman of this meeting. Public interest in the newly formed organization grew so rapidly that it seemed quite advisable to have a regular meeting place and elect officers to take charge of the meeting. The first officers elected were McCormick Kelley as President and Homer Tracey as Chief of the Fire Department. John McLane, Sr. gave the Firefighters the use of his hall, located on Main Street in Rexford. The constitution and by-laws were drawn up and soon adopted. 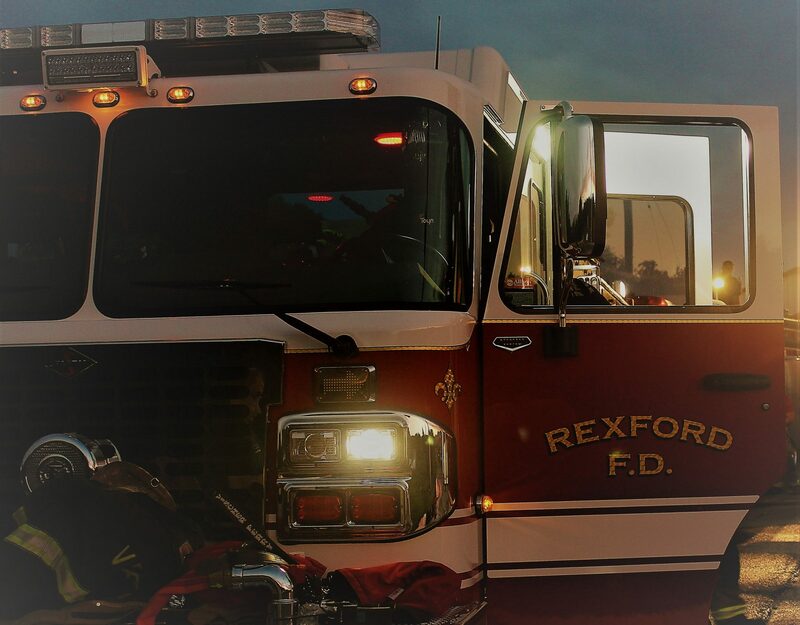 The object of the Fire Department was to “extinguish fires and protect life and property”. The offices to be filled were President, Vice President, Chief, First Assistant Chief, Second Assistant Chief, Recording Secretary, Financial Secretary and Treasurer. The charter under the name of the John McLane Hose Company was granted in May of 1924, by the Fireman’s Association of the State of New York. During the early part of 1924, the first firefighting apparatus was purchased from the Troy Fire Department. The apparatus consisted of 2 horse drawn rigs, at the cost $125. These rigs were not drawn by horses, however, but by the members of the organization. Later that same year, a Reo Speed Wagon chassis was purchased. One of the bodies from the first rig was mounted on the newly acquired chassis. This truck was in service until 1939, when it was replaced by a Ford V8. The original truck chassis lived out its years, in the possession of “Dud” DeLong, as a hay wagon. The largest fire in the village after the founding of the Hose Company was the burning of the huge ice house adjacent to the McLane Hotel in 1924. In addition to the village, “Smoke Eaters”, the Schenectady Fire Department was called to aid them in saving adjoining property. A formal discussion between the Women’s Club and the John McLane Hose Company was held April 21, 1926. At this meeting a committee was appointed from each organization to consider the purchase of Mr. McLane’s building on Main Street for the price of $2250. A second meeting was held May 18, 1926. At this meeting, it was voted to purchase the building from Mr. J. McLane, Sr. at the price of $2250. The terms were, that each organization pay $500 down and that Mr. McLane would hold a mortgage for the balance of $1250. At the same meeting, it was voted that $300 be appropriated for immediate repairs, each organization furnishing $150. The deed was made out as follows: Helen Travis, Mittie Benedict, and Emma Rexford as Trustees for the Rexford Women’s Club and Michael Travis, LeGrande Rexford, and John McLane as Trustees of the John McLane Hose Company.